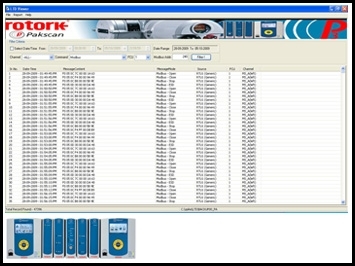 P3 master stations, delivered after May 2011, will contain a Long Term Datalogger (LTD) module. In the case of the hot standby master station, the LTD and the key switch are contained in the same module. For a single channel unit the module will be in the middle slot, which previously contained a blank module. The LTD independently captures and stores all messages directed to the master station from the host connections and all the messages that occur between modules connected on the master station back plane. This information includes host modbus commands and changes in field unit status information. Information is stored on a microSDHC (Secure Data High Capacity) memory card located at the front of the module for easy extraction. A 4GByte memory card is supplied as standard. One file is created on the memory card for each day. The size of each file is dependent on how often the master station is accessed by the host, in practice each day file is generally about 1MByte. The data is viewed on an application called LTD Viewer, which can be downloaded from this webpage. A memory card reader is required to connect the memory card to a PC to enable the data to be viewed. The information monitored and recorded by the LTD can be saved for future reference and gives total visibility of every command and status update for every pakscan device on the network. This information can be used by site engineers as part of their asset management function. Download the LTD Viewer here.